Learn the Value of Investing in the Future of the Industry! The Economic Outlook for 2017 states that while persistent global headwinds and policy uncertainty are ongoing concerns, the U.S. economy's fundamentals are generally solid and rising business confidence should lead to increased investment next year. The report will be updated quarterly throughout 2017. Have You Heard? The Foundation’s Guest Lecture Program Puts You at the Head of the Class! 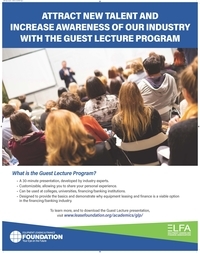 The Foundation’s Guest Lecture Program is designed to help increase awareness of equipment finance and attract new talent to the industry. In just the last few months, members have delivered the Guest Lecture at universities around the country. To learn more visit our website. For questions, contact Alexa Carnibella at acarnibella@elfaonline.org. 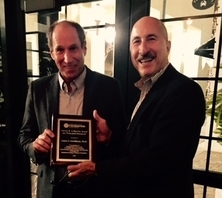 The Foundation honored Jim Schallheim, Ph.D. with the Steven R. LeBarron Award for Principled Research during the Foundation’s joint dinner with the Board of Trustees and the Research Committee in Naples, FL. Jim was recognized for his many years of service and enthusiastic participation on the Foundation’s Research Committee. Thank you to our generous 2016 donors. We are grateful for your financial support and look forward to your continued involvement in our mission to inspire thoughtful innovation for the industry. The Board of Trustees met in November in Naples, FL. to elect 2017 officers, approve the 2017 budget and set the programming plans for the coming year. Guided by strong leadership, expertise and dedication, the Foundation continues to be Your Eye on the Future.